New York Microscope Company (formerly the staff of Mel Sobel Microscopes), located in the heart of Long Island, New York specializes in microscope service and repair with over 100 years of combined professional service experience. We are an authorized microscope repair facility for many of the leading big brand microscope manufacturers. Our highly skilled factory-trained technicians in our microscope repair and service department are ready to restore most microscopes old or new. As we have one on the largest assortment of old microscope parts, we can repair those hard to find discontinued models of microscopes. Whether it’s an old brass microscope bringing it back to its original luster or getting the microscope back to its original factory condition, we get the job done in a professional, timely fashion. Our microscope technicians will professionally calibrate, test, and inspect each microscope to ensure maximum mechanical and optical performance. We use original factory microscope parts where available. All microscopes repaired are warranted for one year excluding items such as bulbs and fuses. New York Microscope Company offers on-site microscope maintenance and service in New York City including the boroughs of Manhattan, Brooklyn, Queens, Bronx and Staten Island. We service upstate New York including Westchester, Rockland, Orange, Hudson, Ulster, Sullivan, Dutchess, Columbia, Delaware, Green, Albany Counties and beyond. 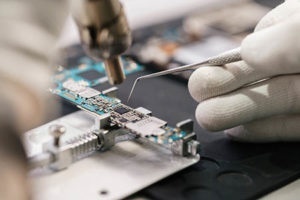 We also service microscopes for the state of New Jersey and Connecticut. If you are located farther away and would like to send in your microscope to our in-house service facility, we will gladly send you packing material so that you can send us your microscope for evaluation. Please see below. We offer on site microscope service and repair to most locations in the US and globally. Please contact us for details regarding your specific request. We welcome all microscope repair services for government and military agencies, industry, schools and universities, hospitals, laboratories, research facilities and medical schools, etc. Disassemble; Clean, Degrease, Lubricate, and reset moving parts to factory specifications. Remove, clean, check, and parfocal all optics. Clean interior prisms and inspect for proper alignment. Remove, clean, and align sub-stage condenser (if required). Test and set the electrical system to specifications. Reassemble and individually test each microscope with a slide under all objectives. Our fees vary depending upon the microscope in need of maintenance. Due to the difficulty in evaluating a microscope without seeing it firsthand, we require you to send your microscope to our facility before we can give you an accurate quote. Our technicians will do a complete evaluation and advise you of the repair costs, and please know that you are under no obligation to repair your equipment. In order to do a proper evaluation, microscopes and microscope parts must be disassembled and evaluated by a repair technician. There is a $25 evaluation fee for each monocular microscope and a $50 fee for each binocular microscope. Small non-optical parts such as mechanical stages require a $25 evaluation fee; all optical components such as objectives, condensers, and binocular bodies require a $50 evaluation fee. All evaluation fees will be waived & deducted off the repair estimate should you decide to have your item repaired or replaced. Return shipping, handling, and insurance is approximately $15.00. For small parts (such as objectives and small components) shipping, handling, and insurance are approximately $25.00 for each monocular microscope, approximately $45.00 for each binocular or trinocular microscope, and higher shipping charges apply for unusual large microscopes within the mainland forty-eight states. Should you desire to send us any item for repair, print out the Repair Authorization Form below and include the appropriate evaluation fee with the return shipping charges.